Why visit Langtry? This tiny settlement of around 30 people next to the Rio Grande doesn't seem to offer much besides a possible resting place on the long journey across the southern Texas desert on US 90. 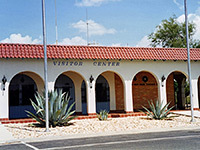 There is a small RV site and some photogenic old ruined buildings but the chief point of interest, and probably the only reason for the town to stay in business is the Judge Roy Bean Visitor's Center, which preserves a saloon and other relics associated with the eponymous judge, an eccentric character who practised law in this wild region at the end of the nineteenth century. Also of note is a cactus garden with many fine examples of desert plants. For most of the last two decades of the nineteenth century Roy Bean was the only judge operating across several hundred miles of south Texas, a position he was appointed to after several months earning a living selling beer and whisky to workers building the trans Texas railroad between San Antonio and El Paso. He was the 'Law West of the Pecos', and mixed dispensing justice with selling liquor - the courtroom was also the local saloon and billiard hall. His reputation for colorful behaviour grew on account of his rough, arbitrary justice methods and particularly after the staging of a heavyweight boxing championship on the Mexican side of the Rio Grande in 1898, at which time fighting was illegal in many US states including Texas. Both village and saloon (the original 'Jersey Lilly') were supposedly named in tribute to the English actress Lillie Langtry with whom the judge was infatuated. They never met but she was to visit, in 1904 shortly after the judge died aged about 79 following a drinking spree. Many buildings in Langtry are abandoned. Some roads are unpaved and the whole place has a rather faded air. One dirt road winds down to an open place suitable for camping in the Rio Grande river valley, which has quite impressive sandstone cliffs on the Mexican side. Another possible camping area is along an dirt road leading to a former dumping site, beside the western approach to the town. 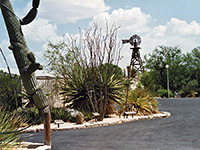 The Roy Bean Visitor's Center offers all kinds of local and not so local information, plus free entry to the gardens. The old wooden saloon/courtroom is little changed since the 1900s, with some original fixtures and fittings. Other Bean-related items are a recently-added reproduction opera house - a copy of the judge's residence after 1896, his silver pistol, several original wagons, and a water pump. 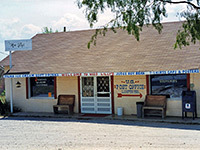 The nearest place with hotels close to Langtry is Del Rio (65 miles).